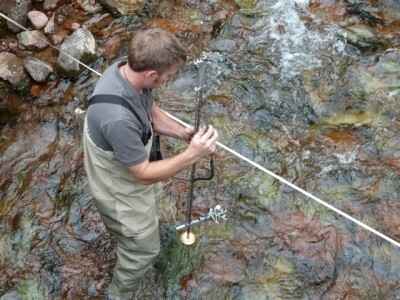 A USGS staff gauge on Castle Creek was installed recently. The gauge, or "gage," as USGS calls it, began measuring the height of the water in Castle Creek on April 26. Once enough initial data has been collected, the gauge will begin producing water measurements in cubic feet per second that show how much water is flowing down the stream. A new U.S. Geological Survey stream gauge on lower Castle Creek began recording public data on April 26 as a result of $34,000 in funding from the Aspen nonprofit group Saving Our Streams. The group is fighting the city’s proposed hydropower plant on Castle Creek and wanted the stream gauge installed so the public could tell whether the city was keeping its pledge to leave at least 13.3 cubic feet per second (cfs) of water in the stream. The new USGS stream gauge is number 09075400 and is called “Castle Creek at Aspen.” The data it collects is published on the USGS website at waterdata.usgs.gov/nwis/uv?site_no=09075400. The process to develop a complete USGS stream gauge begins by installing a staff gauge to measure the height of the river. The staff gauge allows a visual reading of the water height and also includes a sensor in the river. Once different water heights are recorded for a specific location, a formula is then used to calculate how much water is moving past the gauge in a measurement known as cubic feet per second or cfs. The stream gauge is one of about 7,600 such gauges operated by the USGS, which prides itself on offering the public accurate and unbiased streamflow information. The city of Aspen currently monitors how much water it leaves in Castle Creek by tracking how much water it bypasses at its primary diversion dam and also by taking manual streamflow measurements on lower Castle Creek below its three irrigation ditches. While city officials said their method is reliable, the information it collects is not readily available to the public for review. David Hornbacher, the city’s director of utilities and environmental initiatives, said that may soon change, however, as the city has gotten numerous requests to make its data public. Hornbacher also said the new USGS gauge was in a “good location” and would produce good information. “They’ve done something valuable,” he said. The new stream gauge was installed last week by USGS technicians on private property owned by the dePagter family. Yasmine dePagter is a member of Saving Our Streams. She reached a money-free agreement with USGS to have the stream gauge installed on her family’s property, which is river-right just upstream from the proposed hydropower plant location on Power Plant Road. The location is below the city’s diversion dam and its irrigation ditches, and above the location of the proposed hydropower plant’s tailrace where diverted water is to be returned to the stream. Hirsch, meanwhile, signed an agreement with the USGS to have the stream gauge installed and maintained by USGS, which frequently works with private entities to install gauges. It cost $18,000 to install the stream gauge, which sends out readings of water levels to a USGS website every 15 minutes. And it cost $16,000 for a year of maintenance and operations. David Brown, the head of the USGS office in Grand Junction, said the one-year operations agreement with Saving Our Streams is standard. Hirsch said the intent is for Saving Our Streams to raise additional funds to continue operation of the gauge in subsequent years. Hirsch and dePagter said the money for the gauge came primarily from one of the members of Saving Our Streams, who they declined to identify. But they both said the money did not come from billionaire Bill Koch, who has publicly aligned himself with Saving Our Streams. Koch owns an estate on upper Castle Creek near Ashcroft. Saving Our Streams is suing the city in an effort to strip it of its hydropower water rights and stop the city’s proposed plant, which is now under review by the Federal Energy Regulatory Commission. USGS stream gauges were in place on both upper Castle Creek and upper Maroon Creek from 1970 to 1994 before being taken out of operation for funding reasons. Data collected during that time period is being used by the city to estimate how much water is available for hydropower from the streams. Saving Our Streams also is working to install another gauge on Maroon Creek, but Castle Creek was a higher priority. Hirsch said no one from Saving Our Streams talked with the city about the location of the new stream gauge. “The city could have done this a long time ago,” said Tom Hirsch, Maureen’s husband. Hornbacher said the city is not opposed to gauges, but does feel it is getting reliable information about stream flow on Castle Creek without spending the additional money. Maureen Hirsh pointed out that if the city had contracted for the gauge with the USGS, it would have cost half as much because of a government policy that gives a 50 percent discount to tax-paying entities. On Monday, the gauge showed a “gauge height” of 3.51, which may not be all that informative to a layperson. Once a series of gauge heights have been taken, a flow measured in cfs will then be presented online by the USGS, although that could take weeks or months, according to USGS officials, depending on how the water levels in the stream fluctuate this spring. “It takes a while to create a rating, which is the relationship between gauge height and cfs,” wrote Teresa Krizman, the database administrator for the USGS’s National Water Information System in Colorado, via email. “They have begun collecting the gauge height record and now they will begin measuring cfs through a larger range of stage so they can develop a reasonable rating. 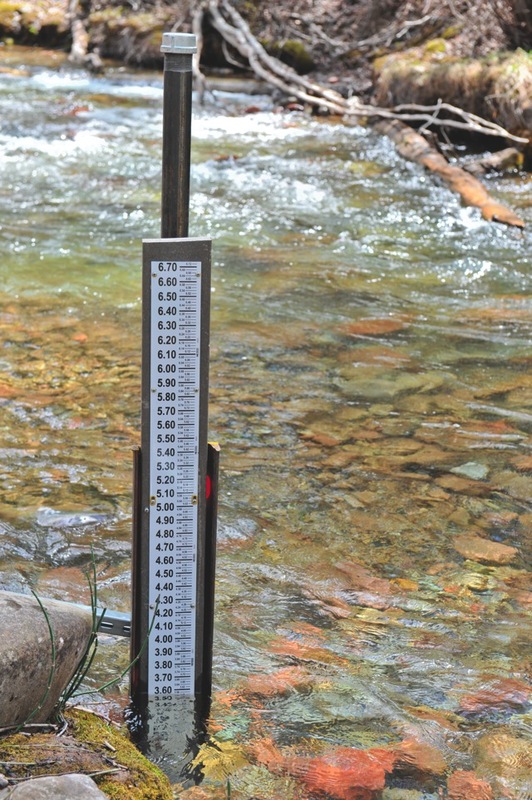 Another local nonprofit, Friends of Rivers and Renewables, recently announced one of its first projects is to install stream gauges on other locations in the Roaring Fork River watershed. The group’s director, Chelsea Congdon Brundige, said she thought the new Castle Creek stream gauge was in a good location and the USGS system is considered the “gold standard” of gauges. Editor’s note: A version of this story was published in collaboration with the Aspen Daily News on Tuesday, May 1, 2012.